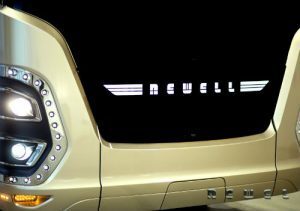 Custom motorhome manufacturer, Newell Coach of Miami, OK., recently announced its all-new p50 Edition body design for the company’s series of coaches for 2017. Three years in the making, the p50 brings a new profile to its line of models ranging from 39 to 45 feet. 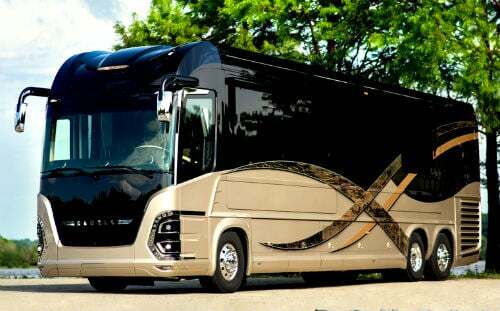 And while its motorcoaches have undergone minor changes to its body styling in recent years, the p50 introduces many exterior modifications and comes standard on all new coach orders. Neatherry explained the redesign was the result of collaborating with Porsche Design Group, which provided input and styling cues for the p50 based on initial concepts from Newell. Newell then took the concept and brought it to life through engineering and product development to make the p50 production-friendly. The p50 was the result of collaborating with Porsche Design Group, which provided input and styling cues. 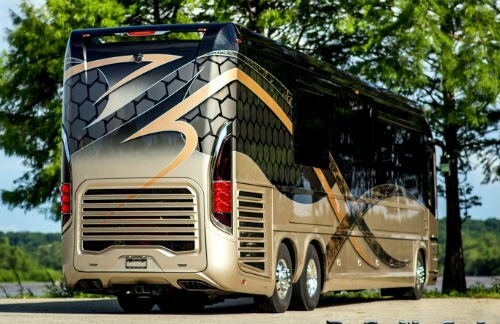 With the popular Intrepid Coach Management System that’s standard on new orders, other features on the p50 Edition include electric-actuated entry doors, push-button exterior door latches, , remote-controlled shore cord systems and new cab window designs with a larger driver-side window openings. <<<The front design on the p50 Edition complete with chrome headlight buckets. Be sure to also see what other RVers are saying about Newell Coach and its coach line.